A robotic baby that breathes, burps and can be X-rayed is being used for the first time by student nurses in Kent. 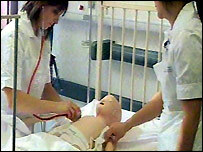 The computer-controlled mannequin, "Sim Baby", is being operated by trainee nurses at the Chatham campus of Canterbury Christ Church University. The £25,000 baby follows in the steps of the life-size "Sim Man", which has been at the campus for two years. Student midwives, nurses and operating department practitioners using it can get feedback from computer readings. Katie Hui, a student nurse, said: "It's not in a real time situation, so it does give you the opportunity to have more time to think about what you're doing." Both mannequins can be programmed to simulate a range of medical conditions, many of which require the students to take immediate action to resolve. Their performance and actions are then monitored and video-taped for debriefing. Lecturer Kathryn Summers said the mannequins encouraged students to "practise clinical skills in a very safe, very controlled environment".